Size 12. The hackle is a bit too long and the tail is drooping, but I'm working on it despite my Parkinson's. So what? I'll bet it catches fish! Looks good but what’s all that goop wadded up at the head/eye? Did you run out of head cement and went with the sheet rock mud you’ve been wanting to try? Hell, Gene, I couldn't do that and my hands don't shake. Hell, I couldn't do that when I was young, my hands didn't shake and I could see. Looks good. Have you tried using polish quills? I have not but am going to. Those polish quills are pretty nice, I just got some in the last 6 months. They really make for a nice looking fly. Polish anything tends to be exceptional. I'm using Polish stripped quills, although I stripped a red quill feather and it was easy and longer and possibly better. When I ordered Polish quills, along with the red and yellow I also got some peacock quills. 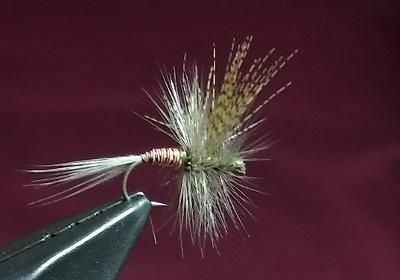 It takes two to make a body on a size 12 fly, for me at least.